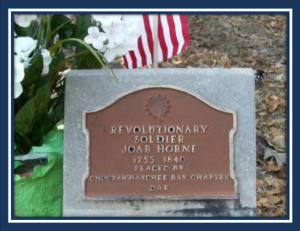 On March 8, 1990, the Choctawhatchee Bay Chapter marked the grave of Joab Horne, December 30, 1753 – July 28, 1840, in Stewart Cemetery near Laurel Hill, Florida. Horne served as a private in the Continental Line. 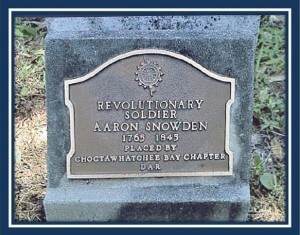 On the same date, the grave of Aaron Snowden, born in 1765 and died in April 1845, was marked in Milton Cemetery, Milton, Florida. Snowden also served as a private on the Continental Line. 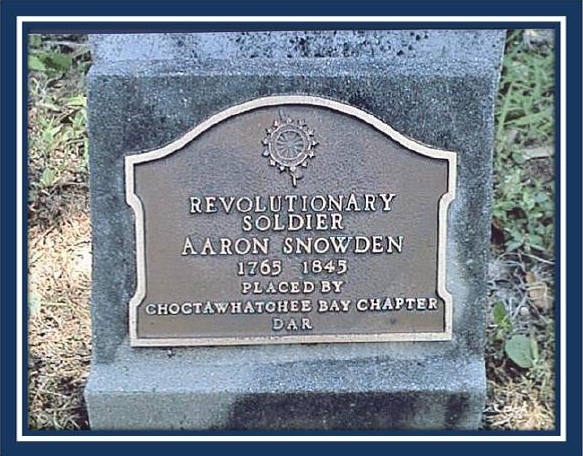 The Snowden-Horne Society, Children of the American Revolution, was named for these two patriots, and is jointly sponsored by the Choctawhatchee Bay Chapter, NSDAR, and the Emerald Coast Chapter, SAR. The chapter also marked graves of Samuel McJunkin, 1725-1808, buried in Christian Cemetery, Hopkinsville, Kentucky and Samuel Monteith, 1756-1840, buried in Lovedale Cemetery, Jackson County, North Carolina.